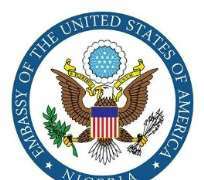 The embassy of the United States of America in Nigeria says its consular services are open and advised those with scheduled appointments to visit the facilities in Lagos and Abuja. The announcement was made in a tweet on New Year Day. The embassy had previously shut its doors to consular services at the locations because of the budget gridlock in Washington DC. U.S. Embassy Abuja and Consulate General Lagos remain open for for all consular business, including visa interviews. Please attend your regularly scheduled interview.